For Stanley Engineered Fastening's Indiana plant, small parts for automotive is big business, requiring fast, efficient production, making quick die change an important part of its success. Don't stop at the capital cost when assessing fume extraction and full air cleaning systems. Review the total cost of ownership as well. From basic nesting to Industry 4.0 efforts, SteinerZ sets the bar high. This Q&A with an industry expert details how setpoint adjustment, equipment upgrades and improved line communication can speed press operation. 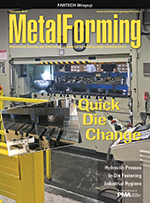 ...the latest and greatest in metalforming and fabricating. Here's a sample. In the first of two articles, we explore why metalformers may benefit from performing fastening operations within the press, and how the technology successfully can be implemented. Part Two will cover troubleshooting. A 1500-metric-ton hydraulic hot-stamping press provides the speed and programmability necessary for this triple-purpose project. The Science of Forming by Daniel J. Schaeffler, Ph.D. Die Maintenance, at What Cost?